A new Chandra observation of 3C186 reveals a very distant galaxy cluster with a quasar and a "cooling core" at its center. Cooling cores are regions bright in X-ray emission where gas is cooling. In 3C186, the temperature drops from about 80 million degrees on the outskirts to 30 million degrees in its core. Finding a system like this at such a great distance – 8 billion light years – is unusual and could provide insight into the triggering of quasars and the growth of galaxy clusters. Credit X-ray: NASA/CXC/SAO/A.Siemiginowska et al, Optical: AURA/Gemini Obs. 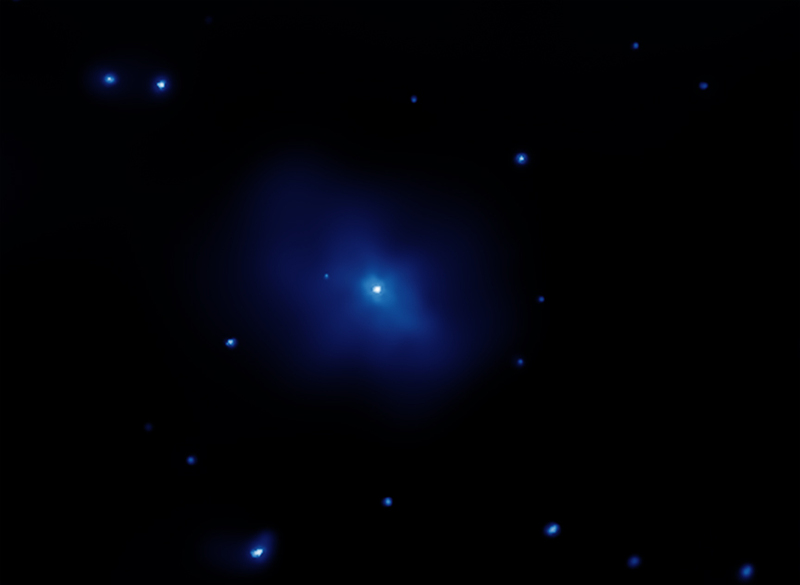 Scale Image is 4.6 by 3.4 arcmin (10.7 by 7.9 million light years). Coordinates (J2000) RA 07h 44m 17.4s | Dec +37° 53´ 17.1"
It truly is a wondrous view, and an awesome insight! But what truly amazes me is the fact that what we/or I are actually looking at is the past. So in a small way we have found a way to travel back in time!!! Am I just an idiot? My congratulations to Riccardo Giacconi. Complimenti. Thanks i like Albert Einstein interesting study the universe's history. Excellent page. Amazing View and a very good work done by NASA. I really love your great work. Could you briefly explain how a "cool core cluster" forms or provide a link to a non-technical explanation? perhaps, I do not understand how intense X-ray emissions cool a collection of gas. This makes me want to find some books on the subject of Quasars. 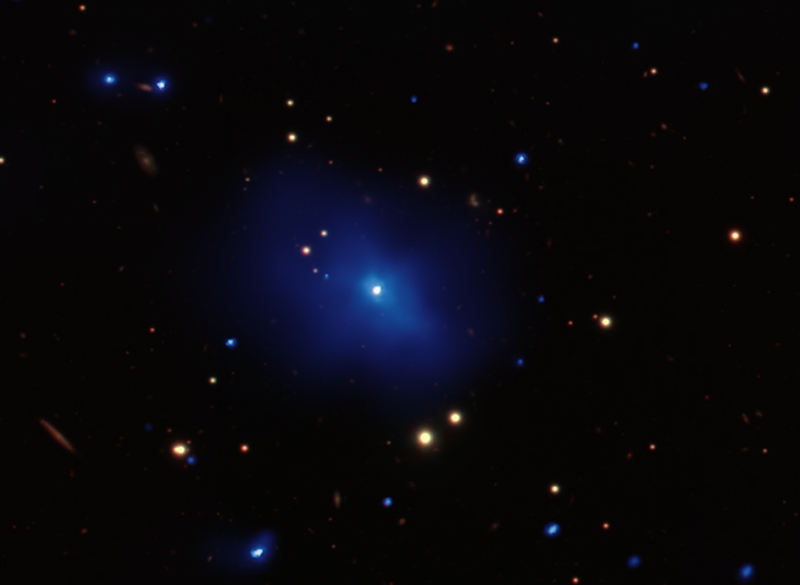 A galaxy cluster with a central quasar located about 8 billion light years away. 8 billion light years from Earth. X-rays from Chandra were combined with optical data from Gemini Observatory. 10.7 by 7.9 million light years. X-rays are blue and the optical red, green. In the constellation Lynx, visible in the Northern Hemisphere.